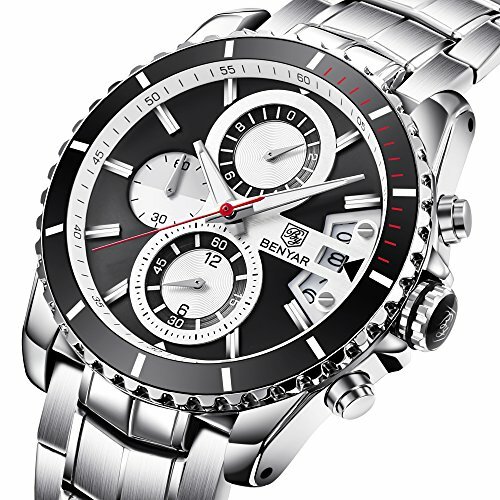 This BENYAR analog illuminator watch offers all the convenience and durability of a sports watch,with an adaptable style well suited for a work day. The large round dial is black, two luminous hands, and a red arrow-tipped seconds hand. The silver stainless-steel bezel is stationary. The bezel's distinctive cog-like edge also gives the watch a stylishly industrial edge. The date displays subtly at three o'clock, and a super illuminator light makes the watch easy to read at anytime. The band is made out of rugged black stainless steel with a fold-over-clasp-with-safety clasp. This analog quartz powered timepiece is water resistant up to 98.42 feet (30 meters) and offers a battery life of approximately two years. It is backed by a 1-year limited manufacturer's warranty.